Thanks so much for visiting Spotlight Weekly today! I am loving this super soft fringe hem cardigan from Pink Blush! It’s definitely on the heavier side, so I think it passes off as an outerwear piece! It is so cozy with a basic long sleeve tee (I bought this in three colors – I love that it’s a little longer in the back and nursing friendly!) and some cute distressed jeans. The lovely Jacqueline and I post our link-ups every Thursday! This week our theme is winter layers or you can pick any fashion/beauty related post to link up! Come back weekly to visit us! This week’s spotlight is Shauna of Lipgloss and Lace. 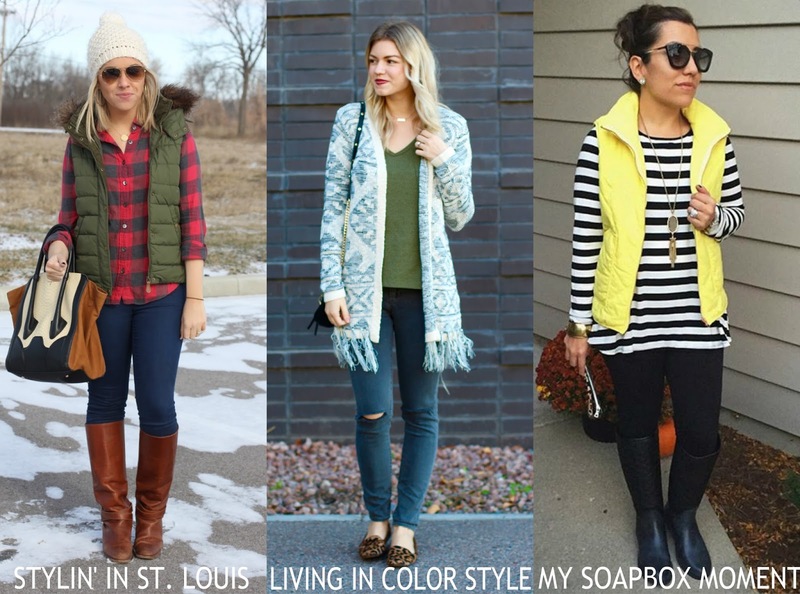 Jacqueline and I love her cute winter layers from last week’s link-up! Be sure to stop by her blog and say hello! NEXT WEEK: for next week’s trend we’re styling anything for a free week. Thanks so much for linking up each week! xo. Looking so pretty in this casual and comfy outfit! Loving this color combo and that sweater is amazing! This sweater is so cute! I love the light blue paired with the olive green top underneath. Such a cozy look! I love it! The fringe detail at the bottom of yours is lovely. Love the cozy cardigan and your leopard print flats is super cute. Love your fringe sweater and the leopard flats! Such a pretty cardigan! I love the combination of blue and green, too. I loved how you styled this look with the different prints! You look amazing – I love this color on you and your sweater is just so chic. You styled a stunning outfit! I'm seriously in love with that cardigan. Great look! !